Notes: Dan Byford of Colorado came up with this design in 1974. 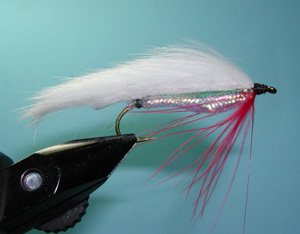 It is one of the modern American Rabbit-lure patterns taken from the original Rabbit flies introduced from New Zealand. 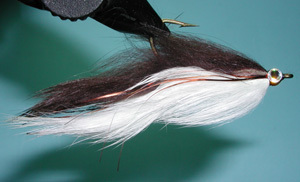 The strip of Rabbit Fur is known as a Zonker Strip, usually about 1/8" wide and trimmed about 1.5" past the hook bend. The fur has the ability to undulate while submerged providing an irresistible action. The strip is usually secured with wire ribbing through the mylar body and around the hook shank. Some tiers will omit the wire ribbing and just secure the strip from behind the head and at the bend of the hook. The body is usually Mylar tubing but this can also be changed for other body material such as dubbed Lite Brite or wrapping Crystal Chennille. The body profile can also vary considerably. Some will use a wire frame, metal tape, or lead wire to create a body form and taper. Other variations will omit this framing altogether but include an underbody which shows though the mylar piping and fills the void created by the Mylar piping with a substrate material. The Mylar piping is secured at the bend of the hook and can be trimmed flush with the thread wraps for a clean profile or left with loose ends providing movement and attraction. Often, some type of soft hackle material is used for a throat. Red is a common color, indicating the flash of gills from an alarmed baitfish. Dan Byford inverted the pattern. 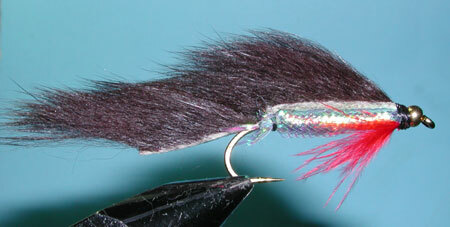 This gave the fly an addition benefit of hiding the hook and allowing the fly to flow along the bottom without snagging. He punctured the strip with the hook point and secured the strip at the head with thread wraps. The head was covered in epoxy and eyes were painted. 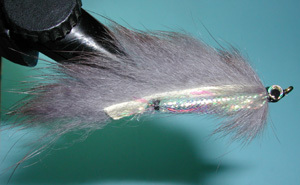 Scott Sanchez of Livingston, Montana came up with an interesting variation called the Double Bunny, utilizing zonker strips both above and below the shank. In tying this fly, make sure that the hook point is centered over the strip and pull the strip lightly over the hook eye to bind just behind the eye. This will help keep the strip in line with the strip and keeps the hide from tearing when under pressure. Then, glue the two strips together with contact cement. 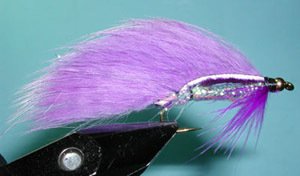 The Zonker is used for all species of trout as well as large and small-mouth Bass. It can be used in either lakes or streams. They can be very effective stripping under the cut banks of the Owens River for Browns and large Rainbows or stripping in Crowley Lake for a perch fry imitation. Try to vary the retrieve. On some lakes, a wind drift with no retrieval can also be a good choice. Weight: .035 lead-free wire over the center half of the shank. Body: Two 1/4" Rabbit Strips bound at the eye. Top Dark strip (Olive, Brown, Tan, or Gray) pierced by hook point, glued down the shank. Bottom strip (White, Light Gray, Yellow, or Tan) for the belly.